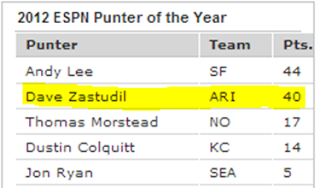 Just wanted to pass along a quick note from Mark Simon of ESPN Stats & Information: The San Francisco 49ers' Andy Lee recently edged the Arizona Cardinals' Dave Zastudil for the NFL's 2012 punter of the year in voting by ESPN writers, researchers and data analysts. I listed Lee first and Zastudil second on my ballot. Seattle's Jon Ryan finished fifth. New Orleans' Thomas Morstead was third. Kansas City's Dustin Colquitt was fourth. Punters are a bit like home-field advantages. They're not going to make a bad team win games, but they can put a good team over the top in close ones. "Lee edged out Zastudil in an extremely close vote. Lee edged out Morstead for the NFL’s net average crown (43.2 yards). Lee finished with 36 punts inside the 20 and four touchbacks. His 9-to-1 ratio of inside-the-20 punts to touchbacks ranked tied for fourth-best in NFL. His 36 punts inside the 20 ranked third. Lee had the second-highest percentage of punts inside the 20 (53.7 percent). He was also a two-time winner of "Punter of the Week" honors this season. "Zastudil led the NFL in punts with 112, 21 more than the player who finished second. He set NFL single-season records for total punt yardage and number of punts inside the 20. Zastudil also fared well by the advanced metrics kept by ESPN's analytics team. 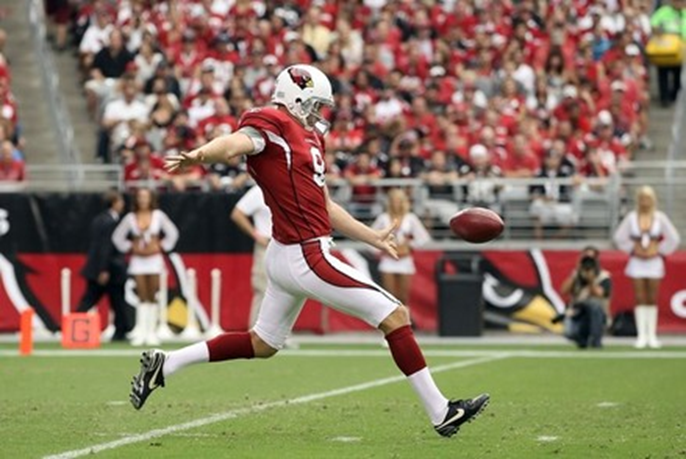 His average punt added 1.4 percent to the Cardinals' chances of winning, which was an NFL best, as was his average expected points added per punt (0.33). "Lee received seven of a possible 15 first-place votes and was named on 15 of the 20 ballots. Five points were awarded for a first-place vote. Three points were given for a second-place vote. Zastudil received five first-place votes and five second-place votes. Lee won our points voting by four points (44-40). Morstead finished with 17 points, Colquitt 14, and Ryan 5." Congrats to all the nominees. Punters don't get a ton of attention. We've got some good ones here in the NFC West.